Gallup releases a semi-regular poll on the state of stock ownership – and it is one of the more depressing poll reads you can find out there in the world. 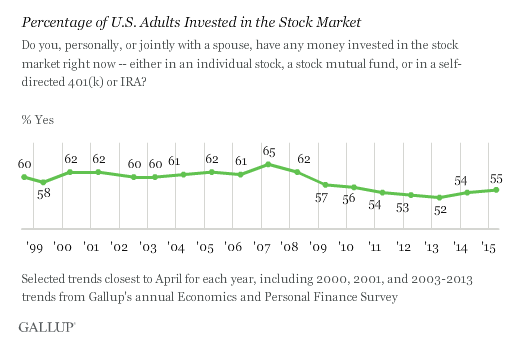 To wit: only a little more than half of Americans have any investments in the stock market, at least self-reported. And it’s worse for young investors. We haven’t even touched our previous peak right before the housing (and, subsequently, stock) collapse of 2008. See that weird little stat? 18-34 year olds, who have the most time to make up for mistakes of their youth and for overcoming bad or risky investments or down markets… actually have the least stock holdings. Maybe it’s a bit unfair for the 18 year old, but I’d like to see that number around the 100% mark for 28-34 year olds. In our last article, we argued that it’s ridiculous not to save for your retirement in your 20s. Hot on the heels of that hot take came another hot take by Allison Schrager writing on Quartz: If you’re under 30, you’re probably thinking about investing all wrong. So, follow along: even if you get past Lauren Martin’s advice to not bother saving money while you’re under thirty, you’ll next have to contend with Schrager’s advice to not save your money in the stock market. That’s absurd. Save money in your 20s, and save some amount of it in risky assets like stocks and real estate. Diversify – Paradoxically, holding different very risky things can reduce your overall average risk. Of course, you need to set it up right – buying two houses on the same block isn’t doing it well, but buying in different towns, diffferent construction years, commercial vs. residential or otherwise is getting better and better. Wait A While – This is the Warren Buffett way – the longer you wait when investing in risky assets like stocks, the better your overall results (when diversified, this has historically almost always produced a great return). This goes by a few forms, but you will be most successful with periodic investing and dollar cost averaging – just buying on schedule means you buy high sometimes, low sometimes – but on average just right. We’ve covered this many times on the site, and you can even run scenarios yourself using our S&P 500 (a large index of 500 big American firms) periodic investment calculator. For the truly curious, I discussed this with Jesse Livermore of Philosophical Economics in a piece on valuation (and why it might not matter). The takeaway: if you’re young, you have more time to recover from losses, even with truly silly valuation and poor market returns. Over a long enough time period (like, say, a 40 year career) – there would have to be a major change in equity market behavior for you to come out worse on the back end (and in some of those scenarios, we’d have bigger problems than our 401(k)s…). Then there’s the problem of compounding losses. Young investors in a down market could see their portfolio almost completely wiped out for a few years. When the markets hit bottom and recover, you’ll be working with less money, so you will still end up with a below-average return over the full time you’re invested. The only time that scenario would be true would be if you stopped your periodic investing in the down market, then sold out of all your retirement accounts. Remember: you haven’t booked the loss until you actually sell, and unless you bought on margin and your broker is on the phone looking for you to pay up, there is no mandate to sell. Think about it in the context of 2008: even if you threw out my advice and stopped buying stock, you still would have tripled up your funds by literally not doing anything until now. So, as with the last article, I have to disagree with the advice offered: buy stock, buy stock young, keep investing, and don’t panic sell. Your youth is your greatest asset, and simply by being young and having the foresight to invest in risky assets like real estate and stocks in your youth, you will likely get a return by literally just waiting and buying according to plan. 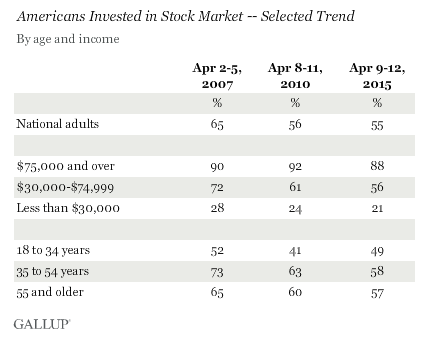 Interesting to see how the drop in % of people who own stock also coincides with the market drop and recovery. The peak was 65% in ’07 and the bottom was 52% in 2013. So as much as ~13% of Americans or 20% of people invested in the market may have sold their stock during the market lows in the recession and then missed most of the subsequent recovery. I found it interesting that the upper incomes actually increased their holdings soon after the fall – not to mention, only a very few are out of the market at any time. I’m hopeful that “opt-out” (rather than opt-in) 401(k) plans and employers can improve stock ownership among young people. Hate to say it, but it almost certainly will if people aren’t approaching investing with the right emotions (to repeat Scott’s point from below) – folks not having to set it up themselves won’t be likely to watch as closely as the type of investor who would panic sell. Schrager’s quote really assumes a lot doesn’t it? Keeping to a schedule of investing and cutting out the emotion can go far. Right – you’ve got to hold on in the down market. If you’re just going to sell at the first sign of trouble, that’s a sign that you’re not approaching investing with the right emotions.